It’s official. I did it! 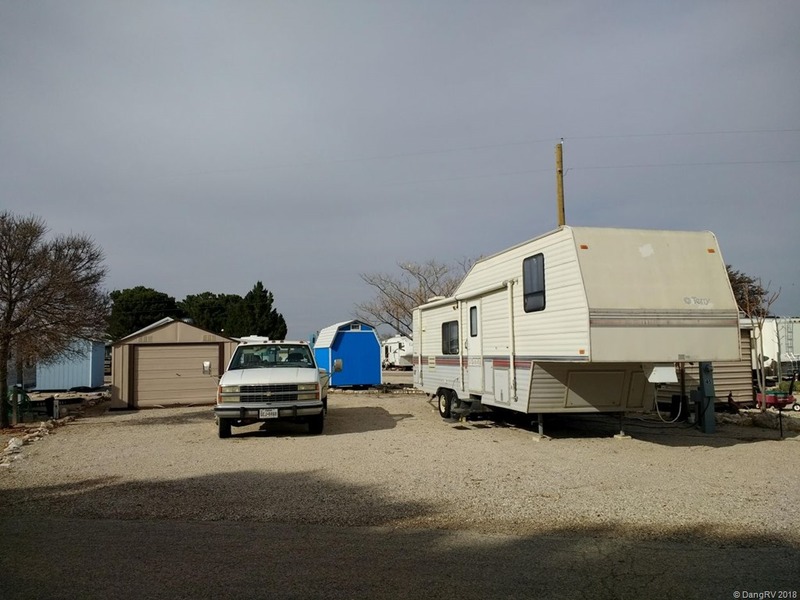 I leased my own RV lot in the Escapees RV park known as The Ranch in Lakewood, NM. When I got back from my vacation, I came down with a cold the next day. That kept me at the park and out of work for a couple more weeks. I got better just in time for their annual Roundup week long celebration. They had lots of fun activities, contests, and a pot luck. I participated in the air rifle shooting contest and won. Then they got the previous year’s champion, also a woman, to come have a shootout with me. I won again! They started calling me Annie Oakley and were so darn nice to me that I had to stay awhile. For something to do, I thought I would check out their sites that were up for lease. I had looked at leasing in other Escapees parks but they all had very long waiting lists. They gave me a list of immediately available sites and several had really great prices in my comfort range. I walked around to look at all of them. One with what they call a casita on it that I would have liked very much was already marked pending. Then I saw the one that was just right for me. 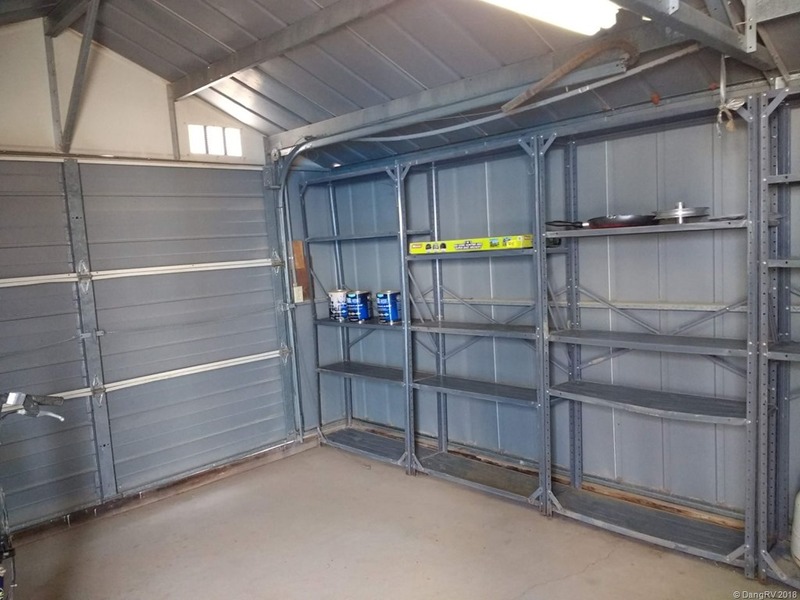 It had a large shed on it with rollup garage door and sliding side door, cement floor and patio next to it, plenty of electrical, a nice long work bench in it, and all the walls are lined with lots of shelves. The lot is large, covered with gravel, close to the clubhouse, but not too close to a walk through path between the streets. It’s exactly what I need to store a lot of stuff I don’t need inside my RV when sitting here and stuff I don’t need when out gate guarding. They had also recently painted the shed and discounted the lot. Perfect. There was no background check done as far as I know. I had to put down a $500 deposit to get started. It took almost two weeks to move the current casual renter off and close the deal with final payment so I had to pay rent during that time. Now that it is mine, I have to pay for my electrical use and a large yearly assessment fee to maintain the park which still works out a lot cheaper than renting a camp site particularly in these high priced oilfield areas. Temperature controlled clubhouse with kitchen, pool table, gym equipment, free book library, free DVD library, puzzles, item exchange table, activities, pot lucks. 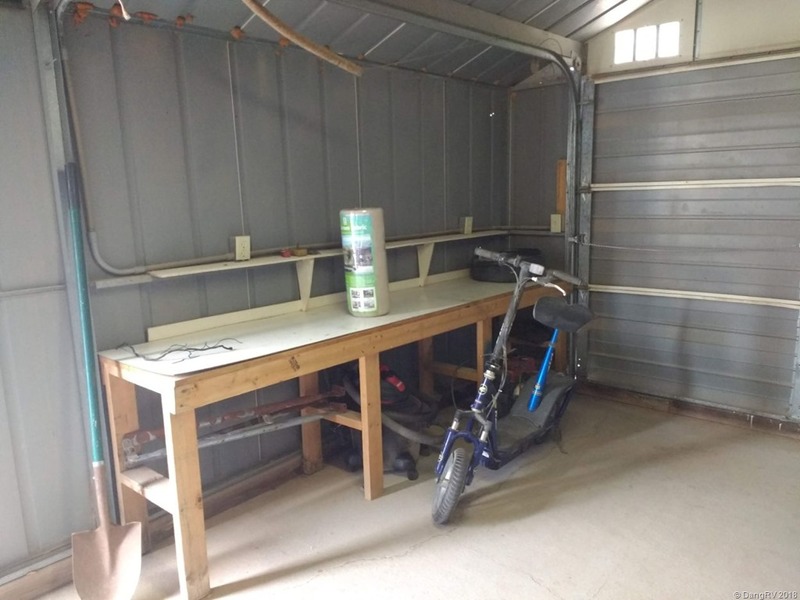 Wood shop with full set of saws, drill press, and tools to use. 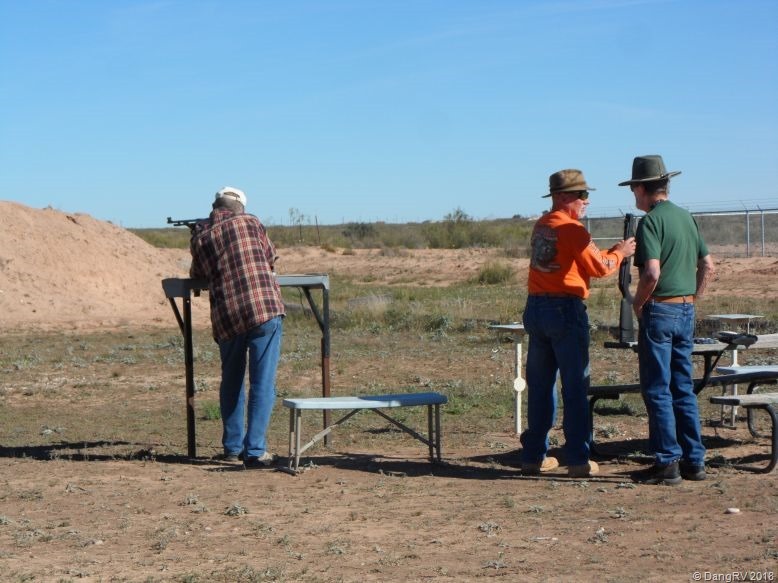 Air rifle and archery shooting range. Inexpensive laundromat with front loading washers. ALL water is run through a reverse osmosis filtration system. Electrical upgraded in my section recently. Free post office box with lease. Package acceptance at the office. Air compressor to air up tires. Boondocking area with fresh water and dump. Large and small dumpsters as well as recycling area. Emergency call list for rides to medical appointments. Location between two small cities with Walmarts, Lowes, Harbor Freight, propane, etc. available. Veterans Admin satellite medical office nearby. State park with a lake nearby and other recreation sites. In the country away from traffic. Can wash your vehicles on site when no state water restrictions and can work on vehicles on site within reason. Now I know you’re thinking that should have been the end of the vacation to beat all vacations. That was a lot to do. It was supposed to be the end. Bernie had booked her flight home for the next day so I drove her to the airport and said goodbye. I had planned to stay one more day and just chill out by the pool. Then I got to thinking, “One pool is as good as another and Disney has two waterparks that are actually pretty cheaply priced.”. 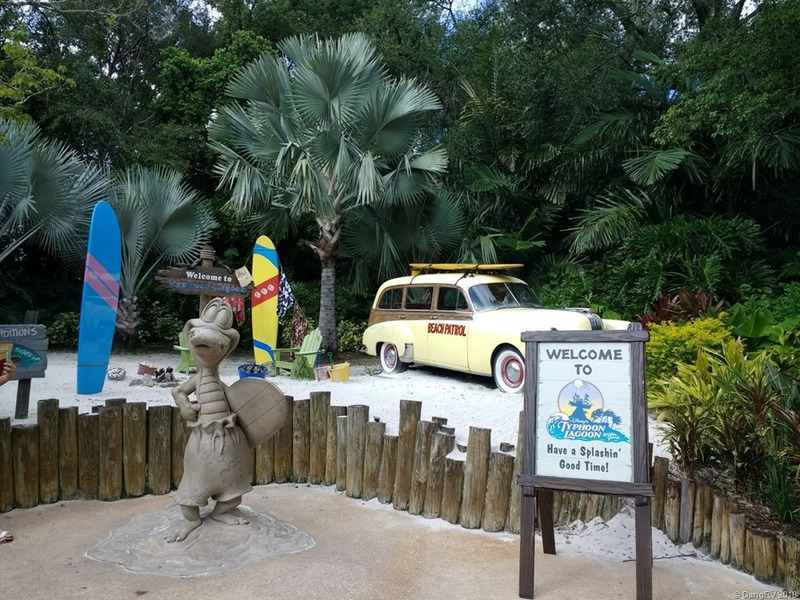 I went back to the condo, grabbed my swim bag, and headed off to Typhoon Lagoon. I really did mean to only pick one park and relax. However, when I bought my ticket, they informed me it was good for both parks which are near each other and just have different themes. Parking was free at both. Who could resist a twofer, especially two waterparks in one day? Some mountains just have to be climbed so throwing relaxation to the wind, I spent half a day at each park. 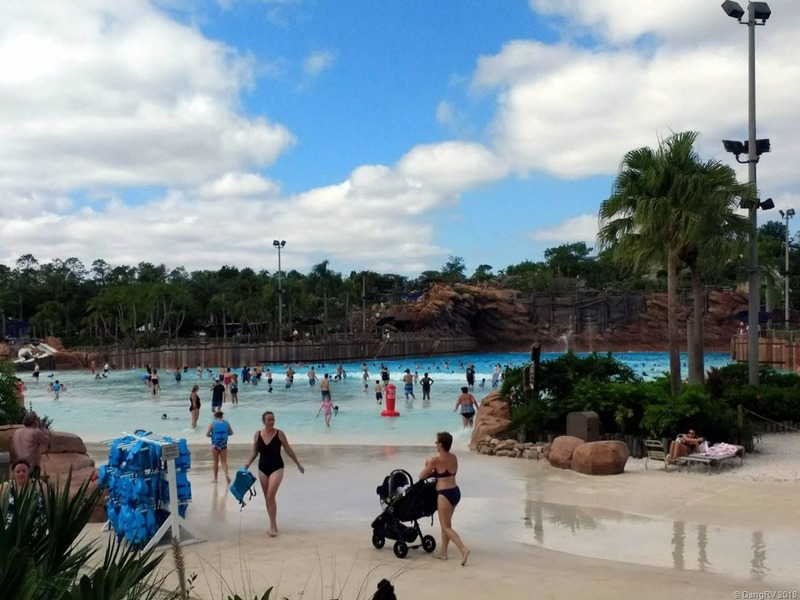 Typhoon Lagoon has some good slides and a very nice wave pool. Blizzard Beach has a fun gondola ride to the top of the mountain to slide down. The lazy river was a little too lazy for my taste at both. I do recommend buying the all day drink cup with free refills all day. I think they had them at Disneyworld too. 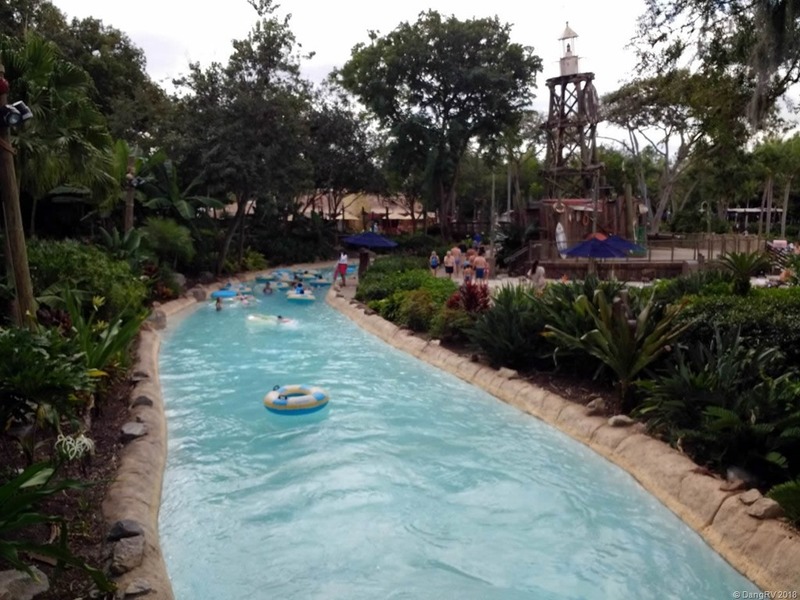 I can’t decide which I liked better because both were fun but, sorry Disney, Schlitterbahn is still the king of waterparks! Oh, when the parks were closing, I ran around till I found an ice cream stand still open and bought a great big cone then purposely sat to eat it right in front of the changing rooms so the little kids would drive Mom and Dad crazy whining for one. Sometimes I can be evil. Muwahaha! I flew home the next day and had a much better drive back using a different route. That was the final end of the vacation to beat all vacations. Yup yup. The vacation to beat all vacations was not over yet! The next day we went to Universal Studios. We are both Harry Potter fans and wanted to see Hogwarts and Diagon Alley. Unfortunately, they split them up between the two Universal parks. That means you have to pay for admission to two parks, not one, and that ain’t cheap. 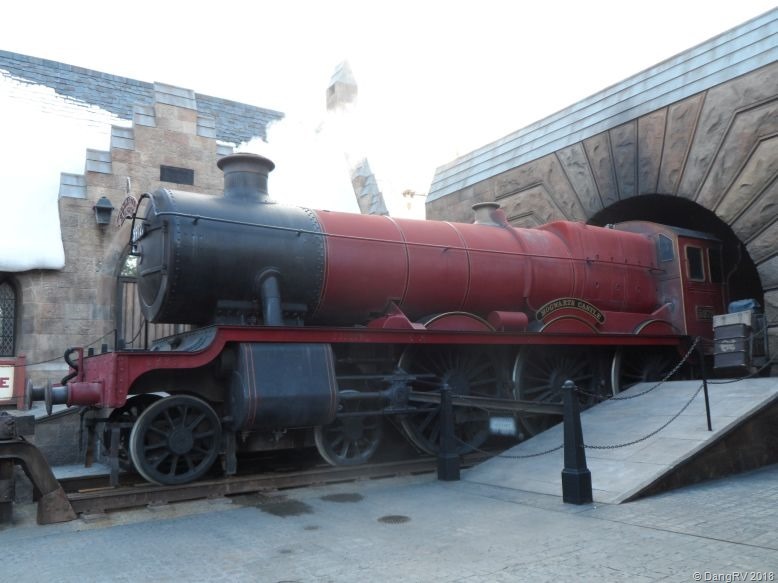 You also don’t get to ride the Hogwarts Express Train between the parks if you don’t buy both tickets. We debated for a few quick minutes then decided this might be a once in a lifetime chance that was worth it. We dood it! We also got a special deal for express passes to jump the long lines. Boy, was that ever worth it! 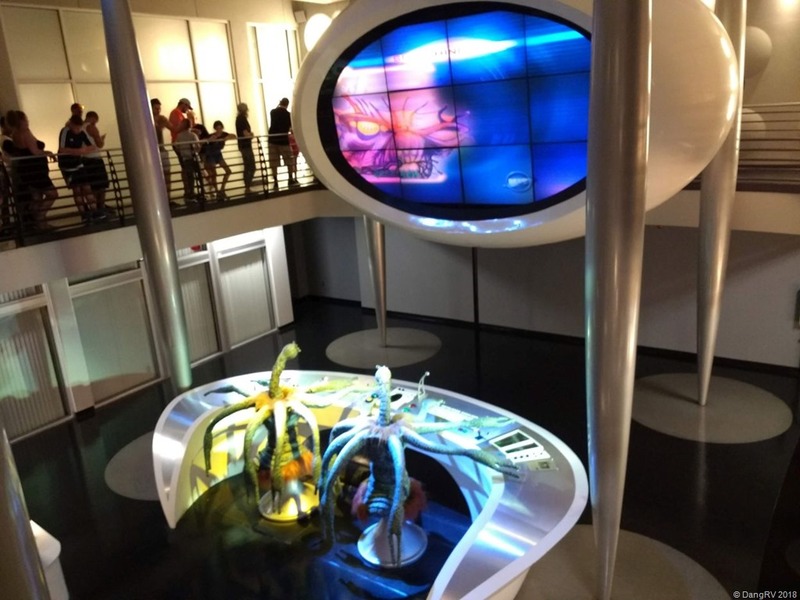 You should also know that security is very tight at both Disneyworld and Universal Studios. They do search all bags so you will stand in line for a bit before getting in. They also charge for parking. Sheesh! Again, we rented scooters to get around ($50 a day) and took off for Diagon Alley. 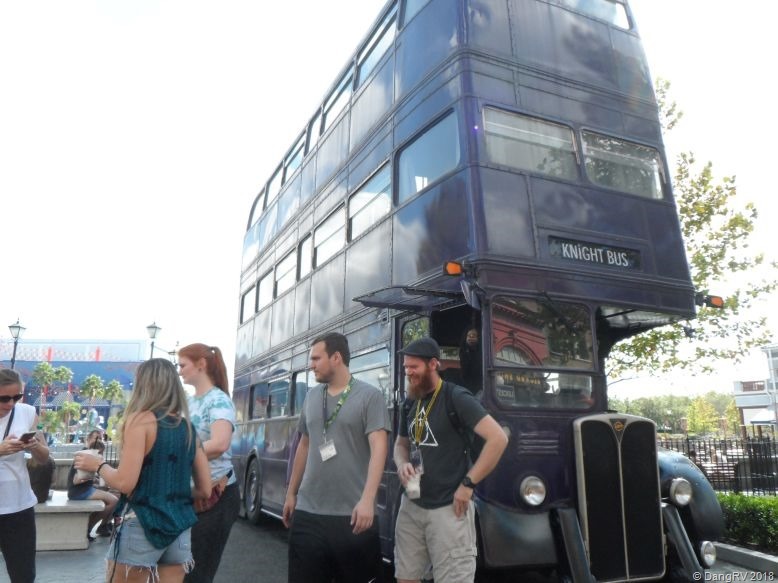 We spotted the Night Bus and got pictures of it then turned to see people coming in and out of a building. 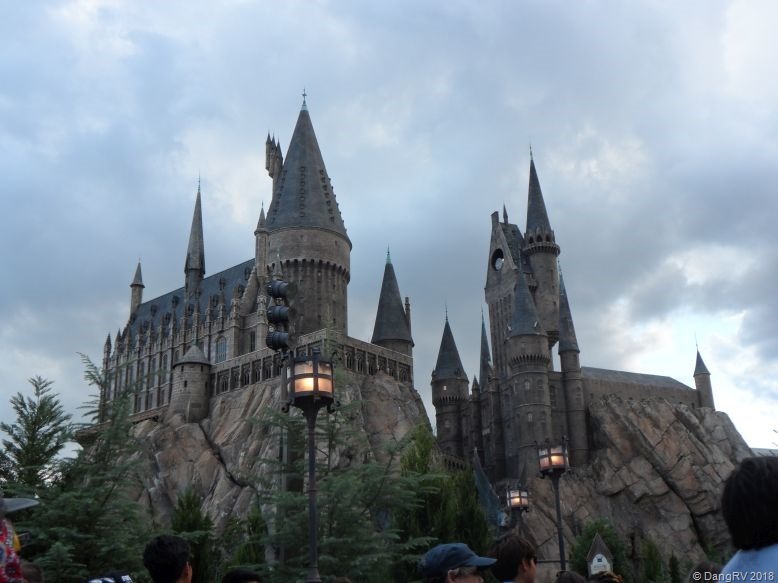 It was actually a façade that hid Diagon Alley. Inside, we found all the famous stores from the books. We purchased a Harry Potter wand at Ollivander’s. It came with instructions and spells but we had a little trouble working it well. Take the time to read before using. 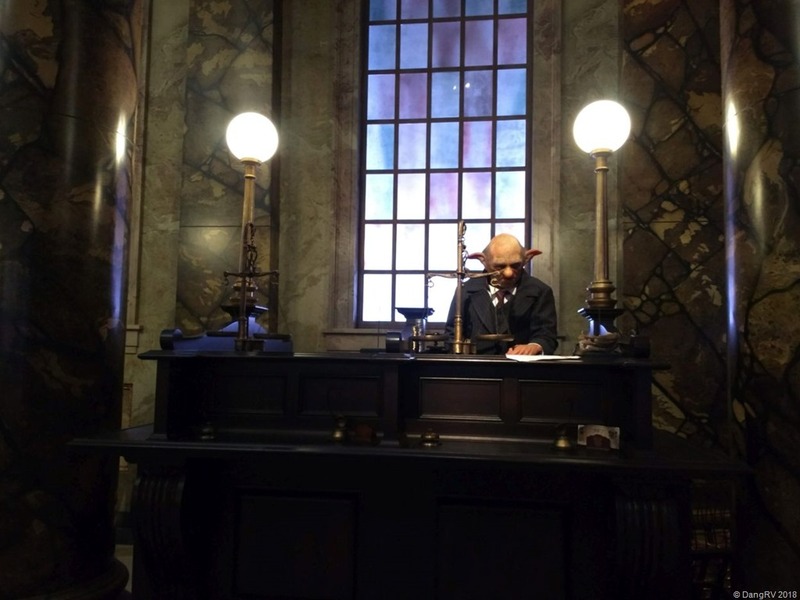 You can also purchase different character wands if you like. 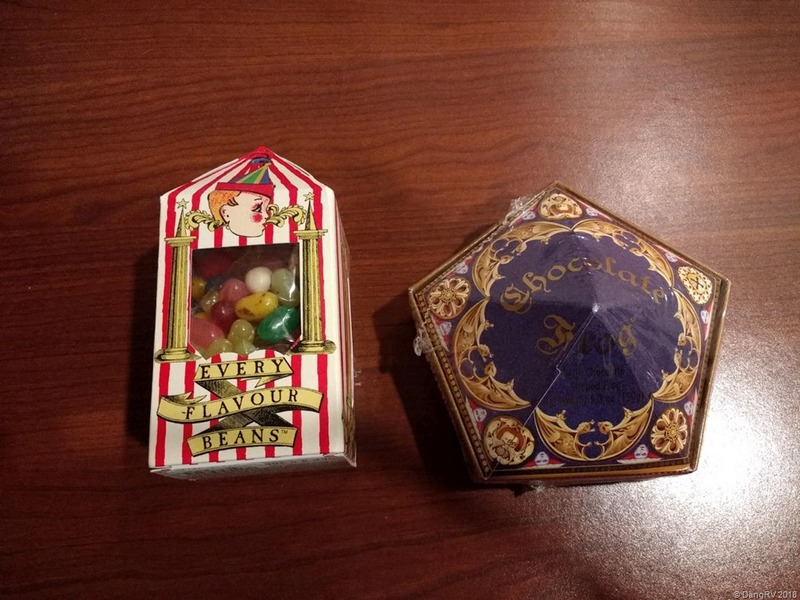 We spent a good bit of time in the Weasleys Wizard Wheezes shop where I got a magic chocolate frog and Bertie Bott’s Every Flavor Beans. Warning: the frog is solid chocolate! I got a Rowena Ravenclaw 3D card with my frog. In another shop Bernie got a Gryffindor hoodie for her granddaughter and I got a Gryffindor lanyard to hold my admission and express passes which you have to show at every ride. 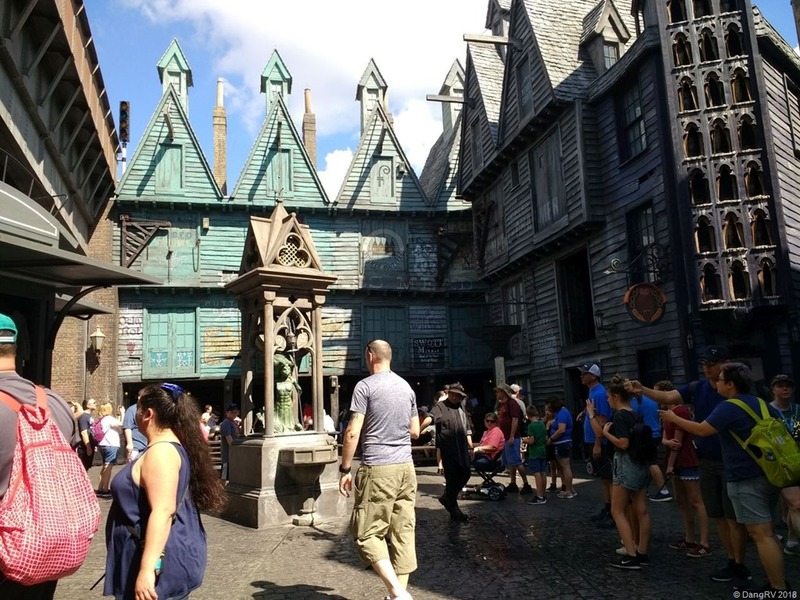 Take a lanyard with a plastic pouch on it for each person when you go to Universal Studios! I also got a large Hogwarts school patch. 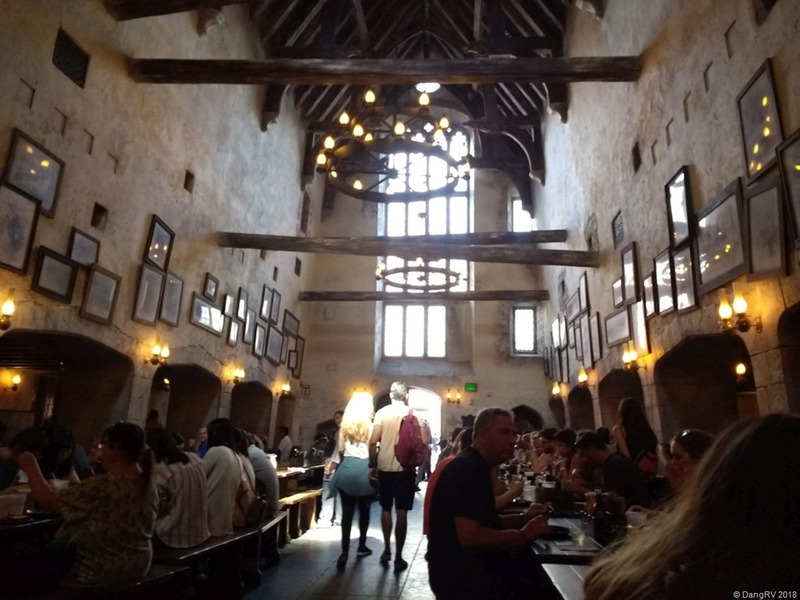 For lunch, we ate at the Leaky Cauldron. We weren’t super hungry and were worried about the fast rides we would be going on later so we split a fish meal between us which worked out perfect. 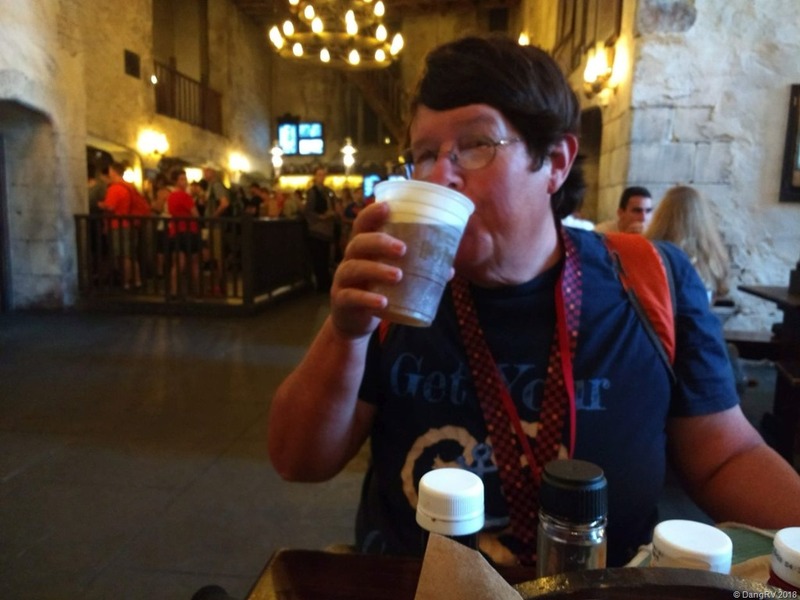 We both had butterbeers which aren’t cheap at $6.99 each but oh my they were delicious. I want another so bad. It has a lot of delicious foam on top. Mmmm! After lunch, we hit the rides. 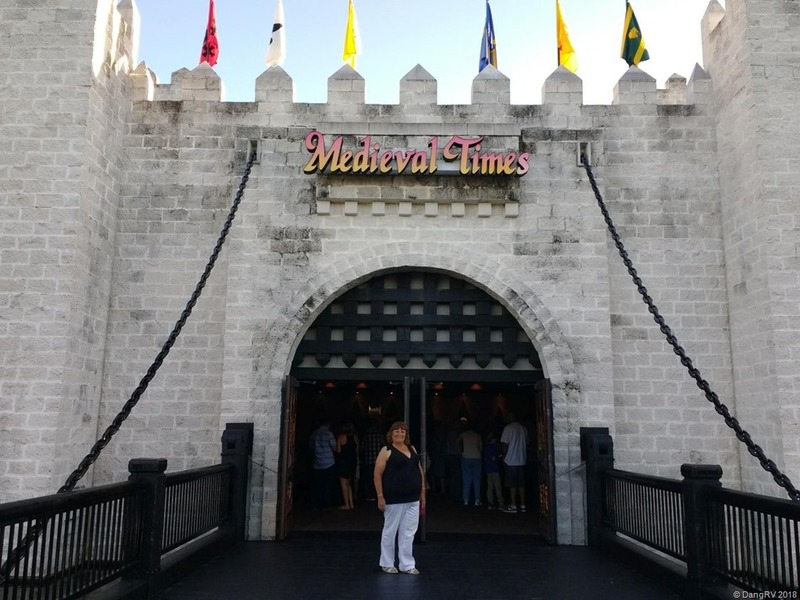 We did the Flight of the Hippogriff™ roller coaster, the super fast and exciting Harry Potter and the Forbidden Journey through Hogwarts Castle, a Quidditch match, and an encounter with death eaters. 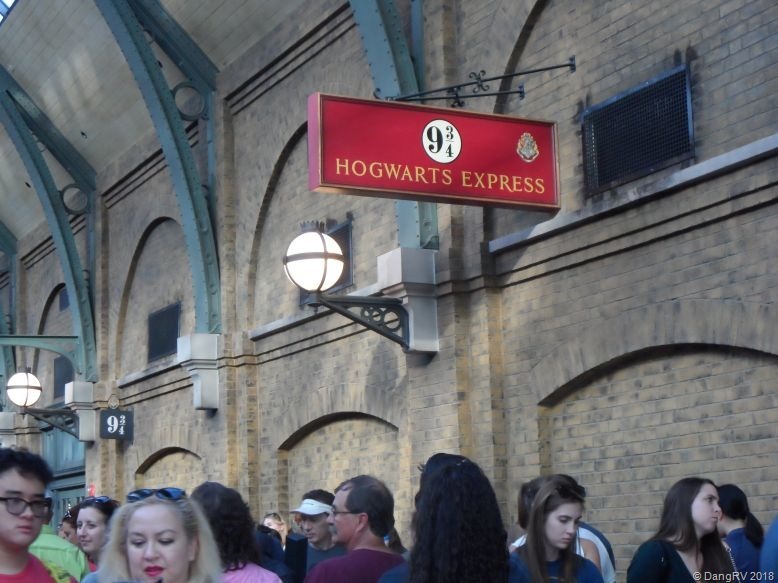 We also did the Hogwarts Express train which is an adventure in itself though mild, a wild ride through Gringott’s vaults, Men in Black Alien Attack ride where you get to shoot aliens, and the Fast and Furious speedy bus ride. So glad we ate light. On the castle ride, stuff was falling out of my pockets so be sure you secure everything very well. The train does accommodate scooters though you will need to walk on and off. 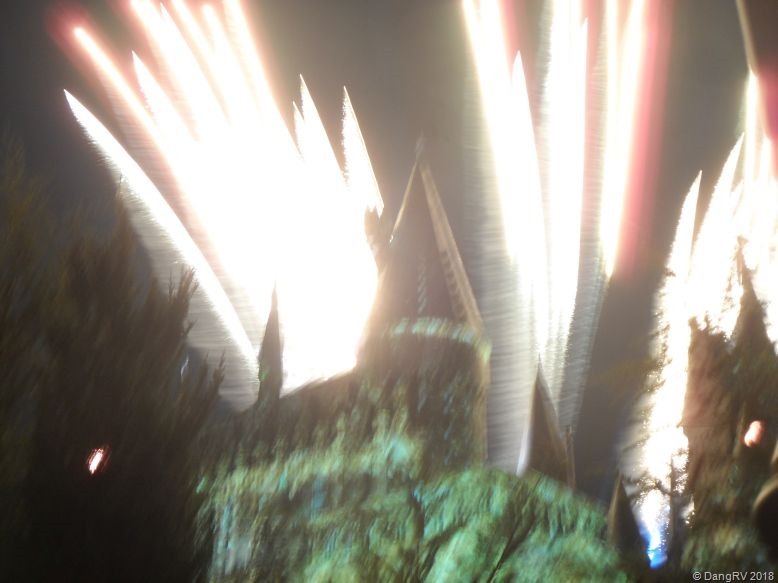 In the evening, we went back to Hogwarts castle to watch the light show on the castle walls which is totally awesome. They Harry Potter music and shoot off fireworks too. When it came time to leave, we stopped at Universal Studios Citywalk at the entrance/exit for dinner at Panda Express. Gotta have my chinese ya know. We had so much fun that we are both hoping to go back some day and see more of the rest of the parks. It’s expensive but well worth it. The vacation to beat all vacations was not over yet. We didn’t pay big bucks to fly to Florida just for a 5 day cruise. Oh no! When we docked back in Miami, we went to pickup a rental car we reserved and drove up to Kissimmee where we stayed in a nice Airbnb condo we had all to ourselves in a condo community with a central pool. The code to open the door was sent to me via email so no key to deal with. It had a good shower, nice kitchen to use if we wanted, and TV. Parking nearby was easy. I didn’t like the hardness of my bed so I pulled out the couch bed to sleep there. I would definitely rent there again and use Airbnb again. 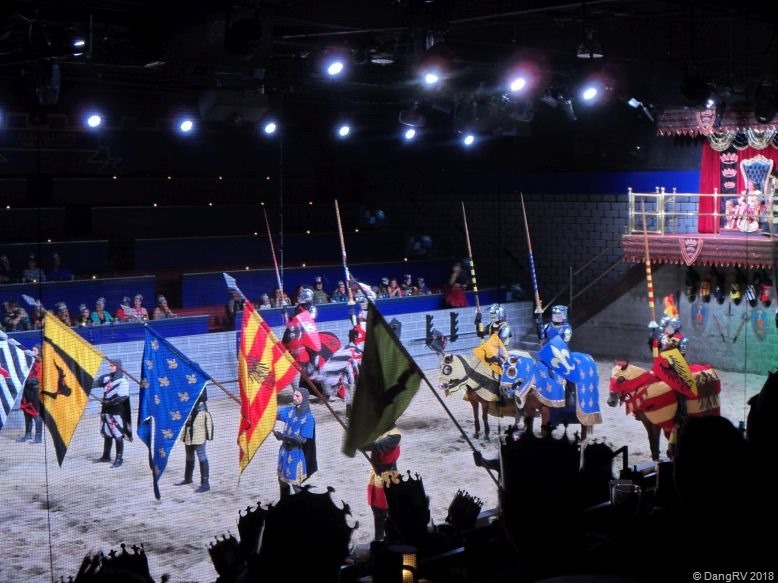 Since we had to eat and Bernie had never been to a dinner show which I love doing, we got tickets online to go to Medieval Times that night. The food was great. 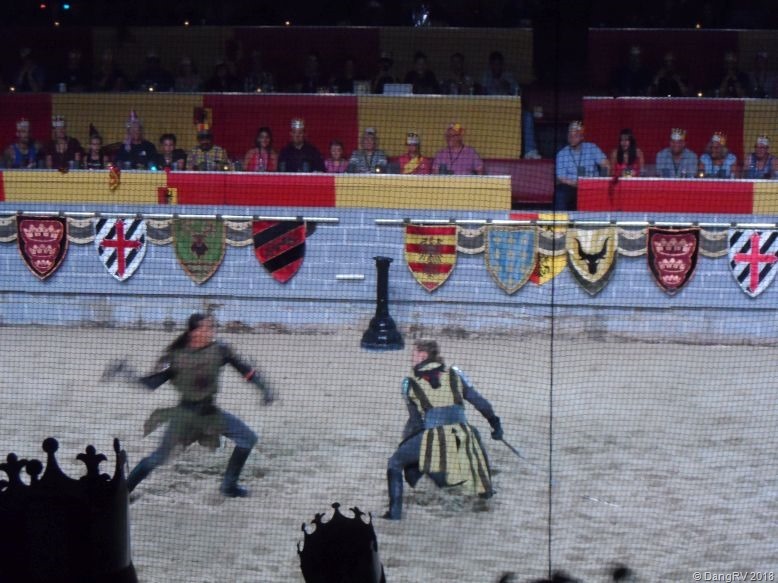 The show was not as good as it could have been due to having new actors who were still learning how to hit and fall properly without hurting themselves. They’ll get better with time and practice. 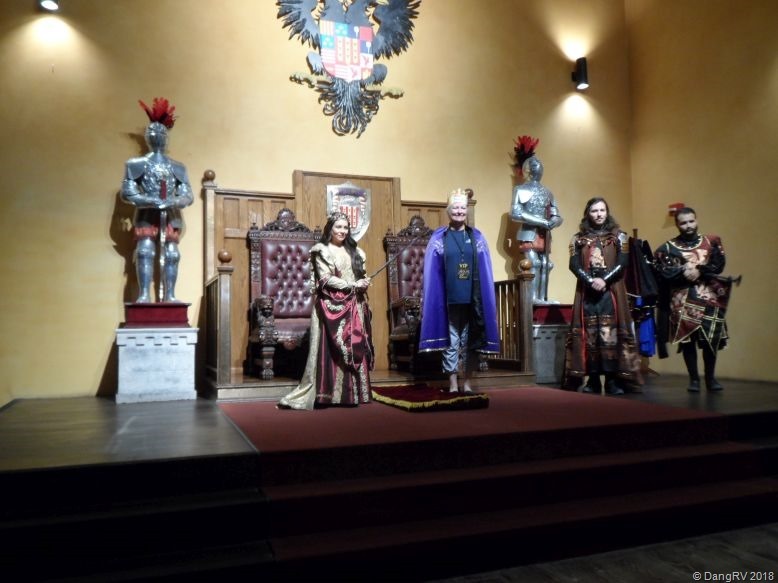 We still enjoyed it for the atmosphere and getting to cheer loudly though our knight did lose. Off to Disneyworld we went the next day. I have been there twice before but it was Bernie’s first time. We took the monorail in from the parking lot. We got off at the wrong stop (my fault) and only figured it out after waiting and going through security. Back on the monorail to the next stop and back through security again. We rented scooters. By the end of the day, I think Bernie understood why. I know I’m too old to walk all over that place all day and survive it. I got to show Bernie one of my favorite attractions that used to be in Disneyland, the Carousel of Progress. I can’t help it. That music is catchy! 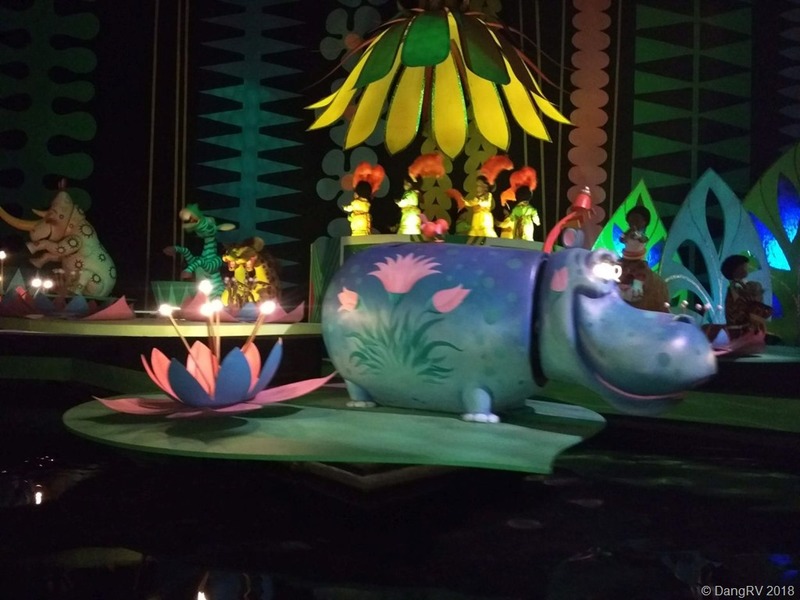 We went to the Tiki Room and took the jungle cruise. 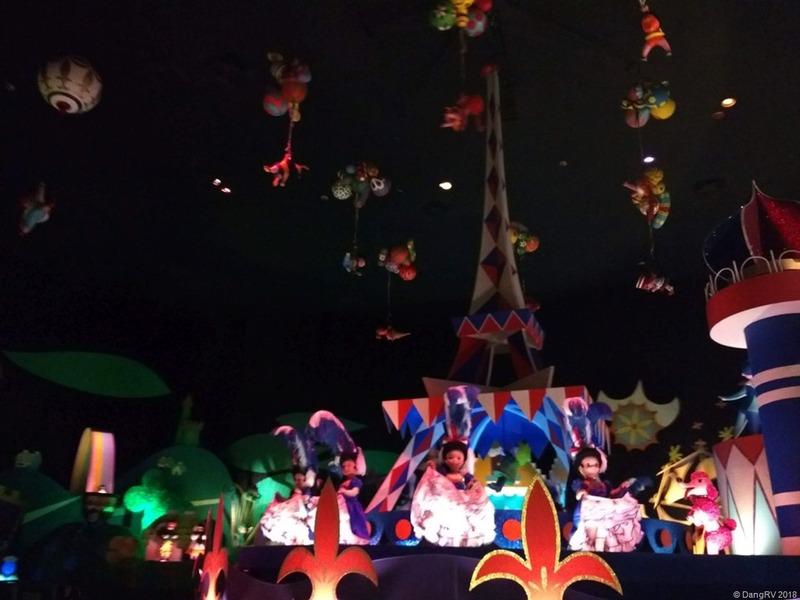 Did the Haunted Mansion, It’s a Small World, Pirates of the Caribbean, Thunder Mountain roller coaster, and more. Their pass system phone app didn’t work at all for us so we had to go to terminals and manually get passes. It was crowded and lines were long as usual. For handicapped people, they are not as accommodating as they once were so you may want to reconsider going there. At the end of the day, we tried to take the boats back to the parking lot but they broke as we were standing in line so we gave up and went to the monorail again. After a long hard day of working at playing, we went out to Golden Corral for dinner. Yum!